Documentarian Ken Burns has made a career of chronicling American history and culture. The War looks at World War II through the eyes of Americans, from Pearl Harbor to Hiroshima, from the invasion of North Africa to the liberation of the Nazi death camps. The film, which has been broadcast on PBS, is about 15 hours long, spread out over seven episodes. It’s easy to feel overwhelmed by the exhaustive detail and graphic images in these episodes. But the interviews with combat veterans and their loved ones make The War engaging. 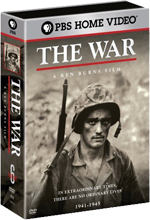 The War is now available on a six-disc DVD set, with some marginally interesting bonus features. As of October, 2007, episodes are still airing on PBS. If you missed some of it, or you want to be able to watch the whole thing, the DVD set is worth a look. Although The War has pictures of world leaders, snippets of presidential speeches and color-coded maps with large arrows, Burns and co-director Lynn Novick mostly tell about the war from the perspective of regular Americans. To further limit the scope, they concentrated on four American communities: Sacramento, CA; Luverne, MN; Mobile, AL; and Waterbury, CT. The war affected not only the young men who went away to fight, but brought about social changes in the towns. Unlike The Civil War, there are no historians, just people who lived it. The interviewees have plenty to talk about — combat, brutality, heroics, prison camps, bigotry, discrimination, loss of loved ones, wartime romances and more. Burns correctly points out in the commentary track that the emotional responses of the subjects gives their memories a feeling of immediacy. Even after more than six decades, one man gets choked up when he recalls a liberated concentration camp. Another feels the fear of being a ball-turret gunner in a B-17. Two siblings relive the pain of losing a loved one. It’s these stories that give The War an emotional punch. Glenn Frazier; who joined the army in a moment of youthful impulse and ended up in Japanese POW camps for most of the war. The death tolls; as high as they seemed on the American side, they were usually at least three times as high for the Japanese. The total cost of human lives. It’s so easy to look back on World War II as a “good war,” the filmmakers and interviewees remind us over and over that, while the war was necessary, it was never good. Episodes one and four have commentary by Burns and Novick. They are full of praise for the interviewees, and they also talk a lot about what they hoped to convey. If you have already watched these episodes, you may find their comments to be repetitive. They put a positive spin on segments that were added late in the project in response to complaints that they had overlooked Hispanic and Native American veterans. Also on disc one is a photo gallery with photographs from the film, short biographies of interview subjects and a 36-minute making-of documentary. Disc six has 17 deleted scenes (43 minutes in all) and 55 minutes of additional interviews. Most of these segments are interesting, though they didn’t need to be in the movie. Not all of these segments have the same aspect ratio; anyone watching this on a 16:9 television may have to adjust the picture. Discs one and six have sections called “Educational Resources.” Both have the same exact material — a video introduction by Burns, a section with information about the Library of Congress Veterans History Project, and a PDF file with more detailed episode descriptions (you’ll have to put the disc in the computer to look at this). More detailed educational resources can be found on the movie’s website. The film is presented in a 16:9 aspect ratio. The picture quality is only as good as the source material. It’s not the filmmakers’ fault that many of the archival films are grainy, scratched and out of focus. The soundtrack features 5.1 surround sound. Most of the sound consists narration and talking-head interviews, though the surround is occasionally noticeable in the battlefield sound effects. Watch the episodes at your leisure. Given their length, you may want to stop partway through and come back to them later. Check out the deleted scenes and interviews on disc six. The behind-the-scenes documentary is only for serious Ken Burns fans. If you want to learn more about the Second World War in the context of this film, check out the movie’s very informative website pbs.org/thewar/.